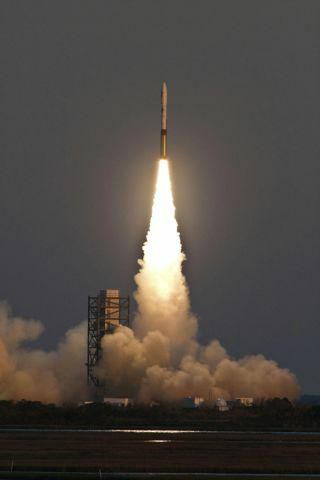 An Orbital Sciences Minotaur 1 rocket blasts off with the Air Force's TacSat-3 satellite onboard. The U.S. military plans to launch a Minotaur rocket Saturday with a secret technology research mission for the National Reconnaissance Office, the government agency that oversees the country's spy satellites. The solid-fueled Orbital Sciences Corp. Minotaur 1 launcher is scheduled to lift off some time Saturday from Vandenberg Air Force Base, Calif. The launch window is a secret for now, but the Air Force plans to announce a time for the blastoff Thursday evening. The NRO is keeping quiet on the mission's specifics, but the agency says it is part of a science and technology development effort to lay the groundwork for future systems. "If you have heard our director speak, one of his priorities is to have a healthy science and technology effort," said Rick Oborn, an NRO spokesperson. "This particular payload carries some of the work we do in techniques and methods to improve intelligence collection. All part of our work to keep improving the value of our data." "It is an NRO mission using a small rocket, which would denote a lighter payload," Oborn told Spaceflight Now. Bruce Carlson, director of the NRO, told an Air Force Association meeting in September the agency is renewing its commitment to science and technology programs. Carlson said he was troubled by a drop in science and technology investment when he became director in 2009. Next year's NRO budget request will call for more science and technology funding, increasing the agency's research budget back to historical levels, according to Carlson. "My plan is that ten years from now, when somebody is standing up here, they'll be able to say 60 percent of the technology that we put into this [new] satellite came out of our [science and technology] program," Carlson said in September. "Unlike the Air Force's and the other services' science and technology, mine is a little bit more predictable because even though what the particular advances are I don't know, I know that I'm pretty much going to be doing signals intelligence, I'm going to be doing imaging intelligence, and I'm going to be doing communications." The NRO's overall budget and the cost of the RPP mission are classified. The spacecraft could be testing new radar or optical imaging sensors to be employed on the next generation of U.S. reconnaissance satellites. The Minotaur rocket will travel south from the California coast, according to a notice to pilots released Wednesday. Launches flying south from Vandenberg usually deploy payloads in polar orbits used by Earth observation satellites. The 62-foot-tall rocket will launch from Space Launch Complex 8 in the southern part of Vandenberg. The vehicle is now fully assembled at the launch pad, according to the Air Force. Minotaur 1 rockets are made up of decommissioned Minuteman missile stages and parts from Pegasus and Taurus commercial launchers. The booster could lift up to 800 pounds to a low-altitude polar orbit. Its 50-inch-diameter payload fairing could fit a satellite the size of a large kitchen refrigerator. The Minotaur's specifications provide an upper limit for the size and mass of the spacecraft to be launched Saturday. Most NRO payloads are much larger. The agency often uses Atlas and Delta rockets to haul hefty satellites into space. A Delta 4-Heavy launch Jan. 20 from Vandenberg orbited a high-resolution imaging platform the size of a school bus. Saturday's launch will be the first time the NRO has flown a payload on a Minotaur rocket. "We will use smaller vehicles from time to time as we match payloads," Oborn said. Click here for Spaceflight Now's LIVE launch coverage of the NRO satellite launch on Saturday.